When we pray, we are simply talking to God, our Heavenly Father. Prayer is not a box we need to tick, but it is constant, continual communication with God. In 1 Thessalonians 5:17, we see that the bible says “pray without ceasing”. Is this what your prayer life looks like? Are you praying without ceasing? Praying without ceasing is when you are leaning on God more than yourself? When we have a problem, so often we are quick to turn to our friends for advice. But God wants us to come to him and seek him first. I believe when we turn to God first, we are relying on him. Prayer is talking to God over his word and as we read the bible, prayer is talking to God about your daily needs, prayer is talking to God about anything throughout the day, prayer is coming to God again and again and again with prayers for breakthrough - in your finances, in your health, in your relationships, in your habits. In five short verses, Jesus himself taught us how to pray. There are seven things we can draw from this prayer. Ephesians 6:18 tells us that we no longer have to pray in a special place, but because we have the Holy Spirit who lives in us, we can pray anywhere! So pray spontaneously. Pray as you walk between classes, pray while you’re on your work break, pray while you cook dinner or while you shower. To create a habit of prayer in your life, I encourage you to pick a time and place to pray. This might be in your bedroom as soon as you wake up in the morning. Or maybe it’s while you’re driving to work or when you’re on your lunchbreak. Set an alarm or reminder on your phone so that you are prompted to stop and pray. 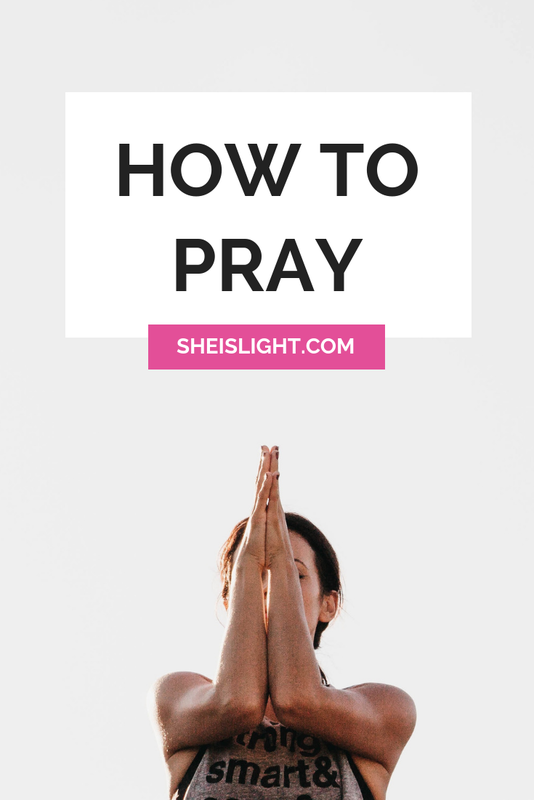 This will help create a habit of prayer in your life that will spill over into other times of your day and become a natural and normal part of your daily life. Your prayers don’t have to be complicated or long winded. You don’t need to use fancy words. Remember that God isn’t some far away figure - he is your Heavenly Father, and he wants your heart. Speak to God like you would speak to a friend. Also remember that you have the Holy Spirit inside of you. Ask the Holy Spirit to help you understand God’s will for your life. Ask the Holy Spirit to teach you, comfort you, advocate for you, intercede on your behalf, counsel you, strengthen you, and be with you in all things. Prayer isn’t a one-way street - it’s a conversation. It’s a time when we get to speak to God but we also get to listen. And honestly, I’d rather hear what God has to say over what I do any day! One thing I like to do is to journal anything that comes to my mind. I will listen in to what God might be saying to me and then write down any prompts I sense from the Holy Spirit. This is a good practice to get into, as it helps form a habit of praying and listening.